What is Audubon at Home? Our life on Earth depends upon natural systems that provide us with air to breath, water to drink, food to eat, and sources of energy and raw materials. Overburdening those natural systems can change the natural equilibrium. Concentrations of the greenhouse gas carbon dioxide, for example, have increased by more than thirty percent since pre-industrial times. This, and possibly other factors, have contributed to a world that is slowly warming. This is producing a series of changes in climate that threaten the continued survival of many bird species. Our backyards, schoolyards and business landscaping are our own private little pieces of nature and can provide a measure of serenity. 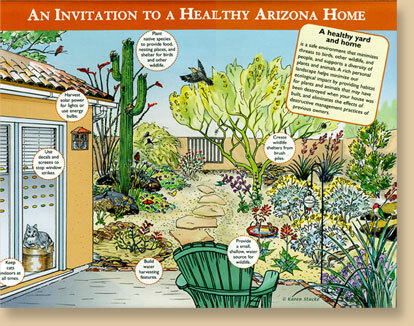 Read about how to landscape natively and register your habitat. If you quailfy, with a $25 donation you can have a sign identifying your habitat as Desert Rivers Audubon approved. Click here to read more and register your habitat! Take a pledge to reduce your consumption of natural resources. We’ll help you find “green products” and business, and learn how to do it! Click here to take the Healthy Planet pledge!